According to the Sanya Price Bureau on 1st April, the standard room prices of 215 hotels in Sanya have been approved and put on record. 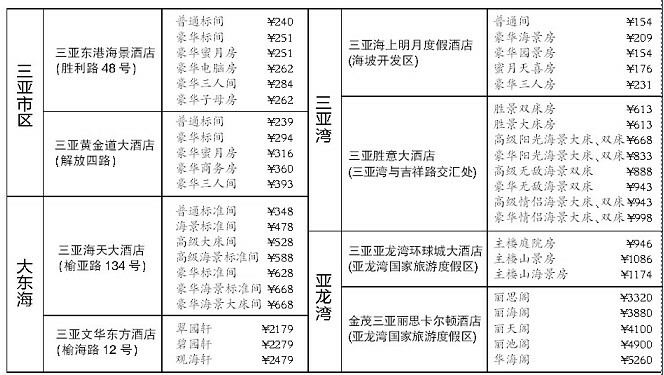 The prices of these 215 hotels during May Day have been released on the Sanya Price Bureau website. These 215 hotels includes 18 hotels in Yalong Bay, 44 hotels in the Sanya Bay, 39 hotels in Dadonghai, 100 hotels in urban area and other 14 hotels. 1000 Yuan hotels take the majority part of the hotels released on the internet, especially hotels in the urban area. Hotels prices that are less than 500 Yuan are not rare in this area as well. Meanwhile, the most expensive hotel room, which sells at 5260 Yuan, is the Hualige in the Sanya Ritz-Carlton Hotel.